Spoilers: vague for everything aired , specific for the "Pilot"; "Home"
Warnings: canonical character death, graphic violence, language, technobable, and uh, Jedi? Summary: Sam and Dean Winchester were raised as Hunters, seeking out Sith Relics, lost souls, and vestiges of the dark side that slipped through the cracks, the evils of the universe that Jedi either didn't know about or didn't care to stop. But now, Sam has made a life for himself in the bustling political center of the Galactic Republic. He's left hunting behind, and Dean has grudgingly moved on, resigning himself to a life of card games and scoundrels, living on the fringes of society. But then their father disappears, and a string of mysterious fires promises to hold clues to their mother's death twenty-two years before. Will the brothers reunite and discover their destiny? Could a Dark Lord of the Sith believed dead for five thousand years really be running loose in the galaxy? And what of an equally ancient prophecy that foretells of a Chosen One and a Healer who will battle for the fate of the galaxy? 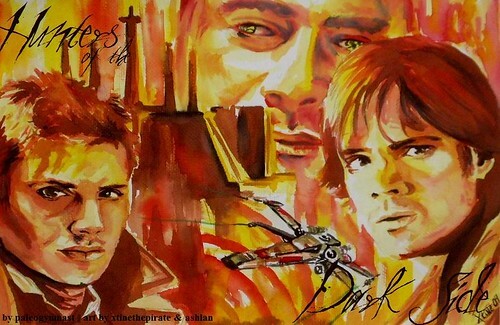 The very Force itself hangs in the balance as Dean and Sam discover truths about themselves they never knew. An alternate retelling of Supernatural set in the Star Wars universe or "What if Sam and Dean were Jedi?" Not a crossover as no characters from the Star Wars!verse are used. Disclaimer: Supernatural and its characters are property of Kripke, Warner Brothers, the CW, et al. The Star Wars universe belongs to Lucas Film, Ltd. and its many authors and artists. I own nothing but my original characters. Written for fun, not profit. Oooh, this sounds awesome! Do you have it one single document that you'd be willing to email me? I download to my eReader since I can't sit for long times at my computer. Hi, I know this is a long shot but do you have a single file version of your story that you'd be willing to email me at amalthia at gmail.com? Your story sounds really interesting and I'd love to read it! Thanks for your time. Hey, thanks for your interest, and I do hope you get to read this. Thanks again! I really really appreciate your interest in the story! :) Thanks for commenting! Hmm... good question. I don't think you would be spoiled at all, espcially not for the plot, characters, and events of the original Star Wars trilogy, and really not that much for the prequel trilogy either, but let me explain myself so you can make an informed decision. This is not a crossover, so absolutely no characters that appear in any of the Star Wars movies, books, games, or graphic novels appear in the fic. Also, this story takes place 500 years before the start of the original Star Wars trilogy (so make that 467 years before the start of the Prequel trilogy), so there is no spoliage of any specific events or happenings in the movies because they're far in the future of when this story takes place. I'd say that's doubly so for the Original trilogy since it really takes place in a different era and as such a lot of things in the universe have changed by the time the storyline of the movies takes place. On the other hand, Hunters of the Dark Side does incorporate real star Wars Places (planets, cities, etc. ), species, weapons, terminology, and general information about the history of the galaxy. There is also some general information about the Sith and Jedi and their attitudes towards the Force. If you read this now and see Star Wars later, any spoiled information is going to be along the lines of "oh, that's what the planet where Sam and Dean did [blank] looks like." I doubt this gives any hints or insight into the events of the Star Wars films. Plus, lots of the events and species and places I do talk about never appear in the films at all. Oooh ... saving this for weekend reading. Wow! This looks so interesting! Looks like I will get no real work done this weekend and spent the whole time reading this! Jesus Pales. This is a monster of a fic, and I thought my one last year was long at 120K, lmao. I got your comment over at AO3 too! Thank you so much for taking the time to tell me you're enjoying the story!! :D That kind of appreciation means a lot! :D Hope you enjoy the sequels too! Thanks again for the pdf! i read 'hunters' and LOVED it big time. And yea, Cas at the end!!!!!! Thanks again for the PDF's, it makes life a lot easier for me! I promise to either post comments in your lj or send you a response once I have read through it. I haven't written fanfiction in a few years but I know how important it is to get feedback :). hey sorry to bother, i'm a tad confused as to the order of these stories. there's the fulcrum of the force, raveling tendrils, and this? give my stunted brain a hand, wontcha? what's the proper order? Thanks for your interest in the series. Hunters of the Dark Side is the first story followed by The Fulcrum of the Force, followed by Raveling Tendrils. i`m only halfway through this one but i seriously wanted to you give you a hug today because of its amazingness. i`m not a star wars geek by any means but i seriously can`t imagine the writing process. collaborating these two worlds must be hard. Hi, this is really late, but would you mind sending me the PDFs of 'Hunters' and its sequel(s), please? I'd really love to read them but I'm about to leave for the summer and -gasp!- no internet where I'm going! Thank you very much, I can't wait to read!